My Mom had me make this as a Christmas present for my Aunt. 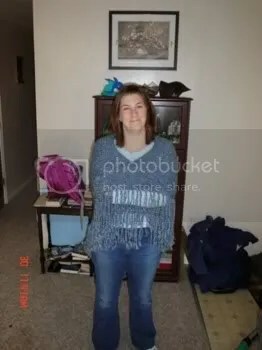 I used Lion Brand Homespun, and it is sooo soft and warm. 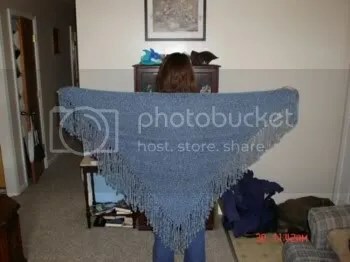 I didn’t have a single problem knitting with it, and as soon as I have a little extra money, I am going to make one for myself. I just Looove it! 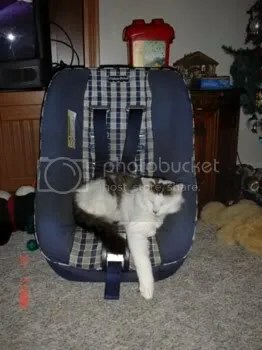 And just becaus I can…here is a picture of my baby Leo, taking advantage of an abandoned car seat. He is angry now that the seat is in the attic, but all three cats were fighting over it, and drove Mommy NUTS! !